Gone were the days of the Generation X. The millennials have now risen and they are starting trend after trend. 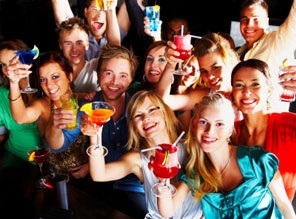 Therefore, it is important to know the best party themes for millennials. They live a fast paced life, they rely mostly on their high-tech gadgets, and of course, their styles are just above the roof. One thing they love to do is to socialize and party. Each individual in this generation live a unique lifestyle that pairs up with their personality. It may be minimalist or rustic, simple or lavish. Either way, the way they celebrate is way more different than how we used to before. They mostly stick to themes and start from there. They have themes for office parties, get togethers, and more. If you are planning a party in the days to come, then this article is for you. Nothing beats an outdoor feel paired with a warm and cozy atmosphere. It gives you a sensual and homey feeling. The rustic theme, though old and have been practiced for a long time, have captured the attention of millennials. They just take it to a whole new level of course. A rustic themed party starts with a great location. You can choose an old barn, a family vineyard, or a house near a lake. Vintage light decors and utensils are the go-to for this kind of themes such as the ever popular mason jars, naked cakes, pastel colored napkins and cloths, stringed lights, and if you are a sentimental type, you can even rent a vintage photo booth. Who could go wrong with the black and white party? Just like the rustic themed party, this one has also been practiced long before the millennials were born. This one is probably the most common party theme ever. This theme is ideal for those who live a minimalist life. It is simple yet elegant. Most locations chosen for this kind of soiree are rooftops, elegant restaurants, and ballrooms. Champagne is a must. All attendees are dressed to impress. For the ladies, this is your chance to bring out that LBD, and for the gentlemen, a tuxedo. Let’s face it, college life was indeed cooler than high school life. Remember your first night when you and your dorm buddies are heading out to those rush parties? This theme is for those who just want to enjoy and not have a care in the world. This fits any budget too because you can always customize. You can have this in your own home or in a lake house. Beers, beers, and more beers are the standard requirement. Great music played in booming speakers. The dress code? None. You can practically wear anything, jeans, shirt, converse shoes and you are good to go. You and your friends can play beer pong and dance until the morning comes. Just don’t blame anyone for your hangover the next day. Perfect for spring break or during summer. The beach theme can be considered laid back but if you want to take it up another notch, you can switch to the Hampton Theme. It is formal and quieter. Ready the white and blue colored cloths for the decors. A variety of drinks can be served and waiters holding different appetizers are a must. Making the list is the retro party. Though some millennials cringe with the idea of having to party like the 60’s, this theme is still favored by many. This one is common for office parties and for those young ones who just like the fashion and aura of the oldies. Hippie clothes, check! Booze, and classic music, check! Locations can either be in an open field, or in a ballroom. This maybe different from how millennials live their lives but, rocking a vintage outfit, is part of the game as well, and most of them are always up to the challenge when it comes to dressing up.